* Hello World: A Baby’s Journey: Few things in life are as wonderful as witnessing the joy of pregnancy and the miracle of child birth. However, with joy comes much uncertainty for new parents. Hello World: A Baby’s Journey is a practical and realistic guide for new parents who crave peace of mind in the form of knowledge and humor. Diana and Aneke hold your hand through your pregnancy, labour and the first 6 weeks after birth with their unconventional and intricate knowledge of your baby’s journey. 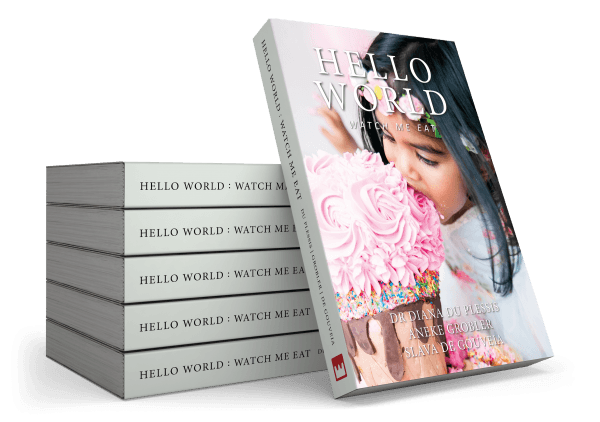 * Hello World: See me Drink: A book about infant feeding is long overdue. During many years of interacting with new mothers, Diana found a lack of help and support from healthcare professionals to provide mothers with unbiased information and consistent infant feeding support. Diana and Aneke have joined forces to assist the new mother with her infant feeding practices in a clear and concise way. Hello World: See Me Drink is a compassionate and realistic take on breast and bottle feeding. * Hello World: Watch me Eat: There is global recognition that we can improve the health of children into adulthood when we see the first two years of life as a key window of opportunity. Hello World: Watch Me Eat provides parents with the tools to make an impact on their child’s current and long-term nutrition and guide them to become role-models for their nutritional intelligence. This edition welcomes registered Dietician, Slava de Gouveia who has been working in a state-funded facility for almost 10 years and along the way had her son, Jorge, both of which have combated her with great knowledge and understanding of introducing solids to your child. 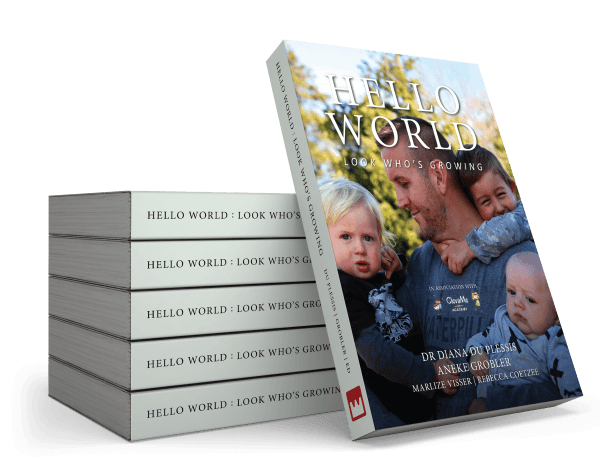 * Hello World: Look Who’s Growing: Will help you follow your baby’s growth and development and prepare you for what you might expect at each stage. Our book covers all aspects of your baby’s growth and development up to 5 years. As you get to know your baby, you will gain more confidence as a parent and be able to spot more easily when something is wrong. But in these early days, you may not be able to tell if the change in your baby’s behaviour is normal or a real problem.